D Curran & Sons Ltd. was formed in 1977. 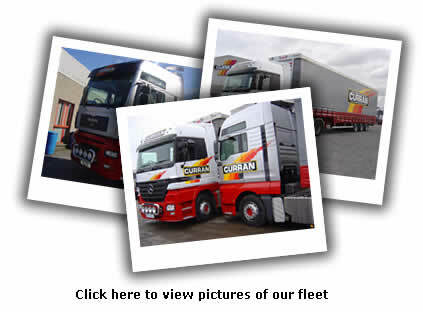 It started off as a small concern but has steadily grown to be a major force in the Northern Ireland haulage industry. The company moved to its current location in Balloo Crescent over 10 years ago. The company offers a wide variety of services which begin with Sprinter vans, 10 to 17.5 tonne rigids and articulated lorries with over 100 trailers which include Euroliners, Tautliners, Stepframes, Double Decks and Moffett Mounty Forklift equipped tautliners. All of our vehicles are fitted with a Minor Planet tracking system and also have satellite navigation installed. This provides us with accurate real-time information on vehicle positions and progress for our customers.